Jerritt Craig, based in the GTA, is a Bassist, vocalist, and educator. He has worked with artists like Taya Marquis, Loony Moonchild, Gabriella Rodgers and more. 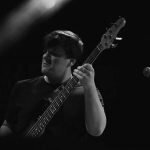 Jerritt is extremely proficient on the Bass, with the ability to perform a wide range of styles ranging from jazz, to some of the most eclectic styles of world music. Jerritt has the ability to teach all levels on the Electric, Fretless and Acoustic Bass. He can also teach beginner voice, beginner guitar as well as advanced Ear Training concepts, and advanced Theory concepts. Jerritt is currently a 3rd year student at Humber College, pursuing his degree in Jazz Performance and hopes to provide new students with a unique and fun way to learn and understand the concepts of performing, recording, and most of all.. enjoying Music!